The summer Milky Way above Blue Ridge Observatory and Star Park. Photo by Todd Bush. TUCSON, AZ AND SPRUCE PINE, NC, 25 February 2014 – The Appalachian Mountains of have stood as silent witnesses to the uninterrupted rain of starlight for nearly a half-billion years, but artificial light now threatens this nightly show. 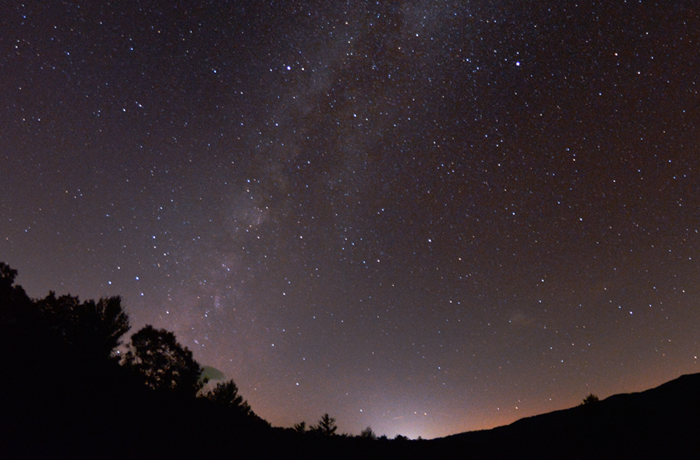 In honor of notable local efforts to preserve the natural nighttime landscape of North Carolina, the International Dark-Sky Association (IDA) announced today it has designated the first International Dark Sky Park in the southeastern Unit-ed States. In recognizing the Blue Ridge Observatory and Star Park, IDA is pleased to acknowledge the work of Mayland Community College (MCC) in preserving a threatened dark-sky location while advancing its educational mission and vision of bringing the experience of primeval night to locals and visitors alike. “While it is one of the smaller parks in our program, we expect Blue Ridge Observatory and Star Park to make a big splash as a Silver-tier International Dark-Sky Park,” said IDA Executive Director Bob Parks. The Blue Ridge Observatory and Star Park is situated six miles west of Spruce Pine, North Carolina, in the Blue Ridge Mountains. The six-acre (2.4-hectare) site, surrounded by rugged mountain terrain and the Pisgah National Forest, is owned by Yancey County (NC) and managed by MCC. It is co-located [CA1] [JB2] with the EnergyXchange, a project in which methane waste gas emitted by an old landfill heats horticultural greenhouses and artists’ studios. Jon Wilmesherr, MCC Director of Learning Resources Center and Distance Education who led the effort to secure the IDA award, is optimistic that the Star Park will serve as a model for land management by colleges and universities. “I hope other educational institutions will consider the benefits of sponsoring an IDA star park, where the demonstration of lighting conservation can lead visitors to a better understanding of the urgent need for the preservation of the natural night sky,” Wilmesherr said. · having outdoor lighting consisting entirely of fully-shielded, low-color-temperature light emitting diode (LED) fixtures upon receiving IDA recognition. Given administrative oversight by a single organization and the few artificial lights already at the EnergyXchange,[CA3] converting[JB4] all of the site’s fixtures to dark-sky-friendly LED was straightforward and cost effective. MCC hopes the Star Park will be a regional leader in the implementation of such novel, energy-efficient lighting technologies at public facilities. “We have an incredible opportunity to be an example to others who might go home and take another look at the lighting and light pollution where they live, and realize that it doesn’t need to be that way,” Hampton said. The EnergyXchange is among the pioneers of waste gas utilization on small, rural landfills, and is one of the nation’s model energy recovery projects. It captures an amount of carbon in the form of methane gas equivalent to planting 14,000 acres (5,666 hectares) of trees or taking 21,000 cars off North Carolina roads each year according to Environmental Protection Agency estimates. Its presence has transformed the disused landfill, built atop a former mica mine, into a local center of activity for artists and agriculturalists alike. The latest rebirth of the site focuses on a different natural resource: dark night skies. Identifying the Star Park for potential IDA recognition began soon after MCC assumed management of the site in 2013. MCC, ranked among the top community colleges in the United States, plans to situate an observatory on the property featuring a state-of-the-art 34-inch (0.87-meter) telescope dedicated to educational and public outreach activities. The Samuel L. Phillips Family Foundation, a local nonprofit organization, provided funding for fabrication of the telescope’s main mirror. MCC will partner with BRAG to offer dedicated on-site programming for quarterly dark sky events, as well as to implement a long-term plan to monitor the quality of the night sky over the Star Park for years to come. IDA established the International Dark Sky Places conservation program in 2001 to recognize excellent stewardship of the night sky. Designations are based on stringent outdoor lighting standards and innovative community outreach. Since the program began, six Communities, 15 parks and eight reserves have received International Dark Sky designations.